Translation from DM: I'm tired of this campaign and want to start a new one. Are there any Hulkamaniacs in this Dungeon of Doom? @theprofprofessor, I'm just looking fo the Yeti! What I've personally done before is the boot of quick stride. It's just one single boot that increases the walking speed of the one foot by 5 feet. You end up going in large circles. 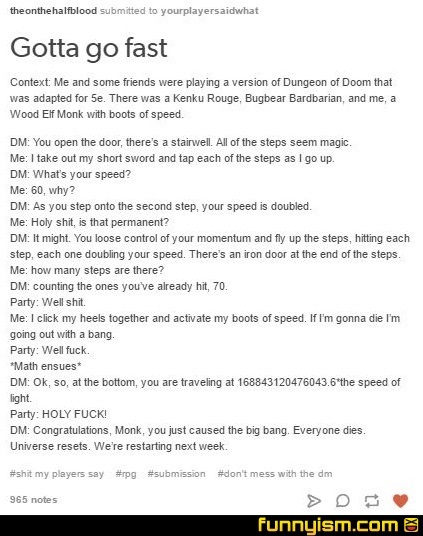 DM didn't require a Dex check, before losing control, from a Monk. This could've been avoided. But would it cook a chicken? Impossible! You must account for relativity! It’s weird how these have become popular in the past few years. When I was younger, the response to this and many other such stories would be to set up a new group or lose the relevant player.